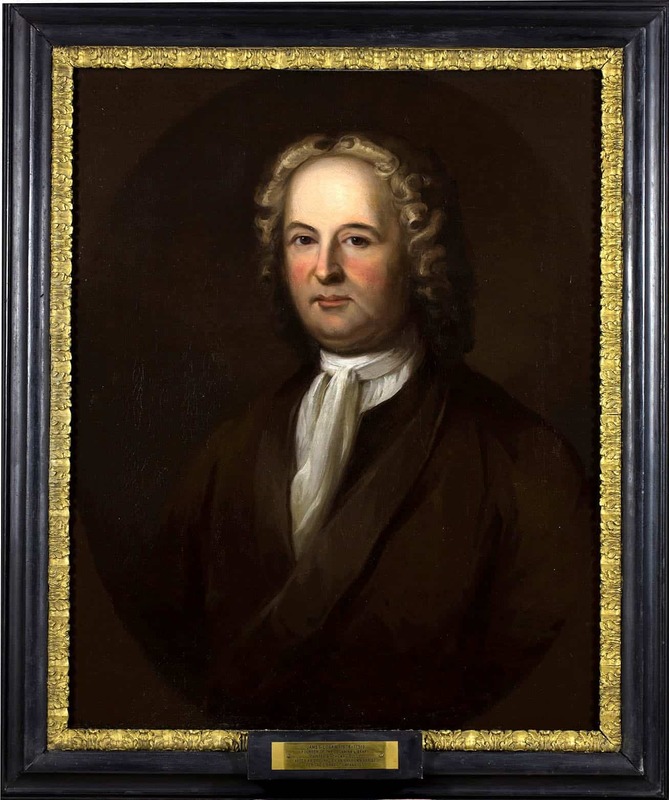 By the time he died in 1751, James Logan—who came to Pennsylvania as William Penn’s secretary in 1699 and went on to occupy many of the highest political and judicial offices of the province—had assembled the best collection of books in colonial America. Logan was a book collector all his life—as well as a linguist competent in a bewildering number of languages; a classicist who crossed swords with the greatest European editors in the margins of his books; and a scientist who described the fertilization of corn by pollen, understood and used the new invention? 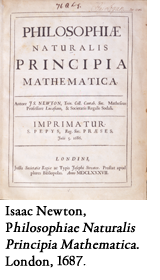 of calculus, wrote on optics, and made astronomical observations. 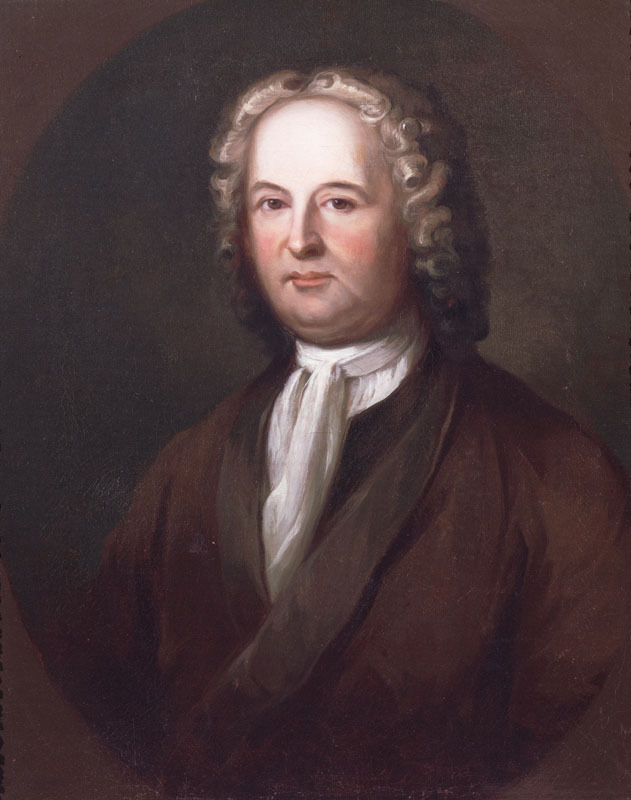 This Quaker virtuoso acquired books to feed the wide-ranging interests of a voracious intelligence, ultimately gathering more than 2,600 volumes, chiefly in Latin and Greek. In his later years, Logan decided to leave his books for the use of the public and established a library in Philadelphia, inspired by the example of Oxford University’s Bodleian Library. He designed and commenced building a structure on Sixth Street to house the institution and wrote an elaborate codicil to his will to establish and endow it. 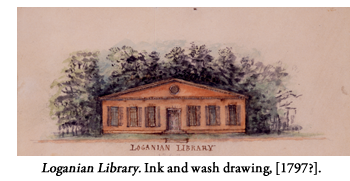 The Loganian Library was created in 1754 as a trust for the public with Logan’s two sons and Benjamin Franklin among the trustees. A printed catalogue was issued in 1760, the year the library opened. 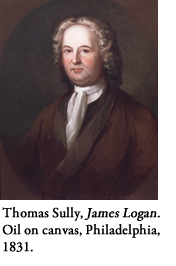 In the decade following, the library grew to nearly 4,000 volumes through the bequest of the medical library of Logan’s brother, Dr. William Logan of Bristol, England, passed on by his American nephew, James Logan’s son William. Although Franklin promoted Logan’s library as a valuable resource available to professors and students, use was seldom made of the scholarly works in the collection. In the eighteenth century there was little interest in the classics and advanced mathematical sciences on the part of merchants and artisans in Philadelphia. Moreover, two of the things that were unique about Logan’s library contributed to its unpopularity: it included few works of belles-lettres in English and almost no polemical theology or politics. 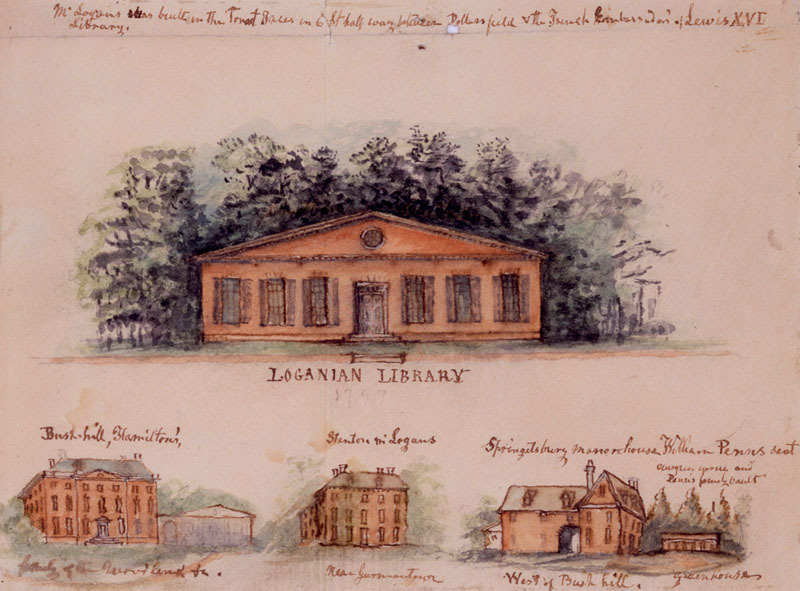 The Loganian Library was closed during most of the Revolutionary War, but once peace returned James Logan, Jr., the sole survivor among the original trustees, increasingly came to feel that the management of the library was a burden on his family. He petitioned the General Assembly of Pennsylvania to vest the trust in the Library Company in order to make his father’s benefaction more useful. In 1792, the books and assets of the Loganian Library were transferred to this institution. This enormous acquisition nearly doubled the holdings of the Library Company, making it the second largest library in the nation, after that of Harvard College. 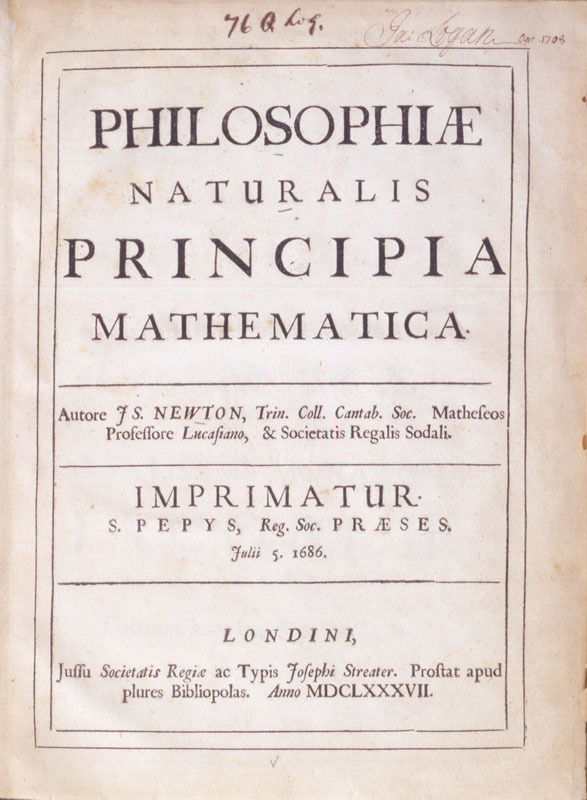 Among the marvels from the Loganian Library still on our shelves is the first copy of Newton’s Principia to touch the soil of the North American continent. Meanwhile, Penn’s other “secretary,” a slope-front writing desk made of oak with walnut facing—one of the rare documented possessions of the founder of Pennsylvania—sits on public display in our Logan Room. 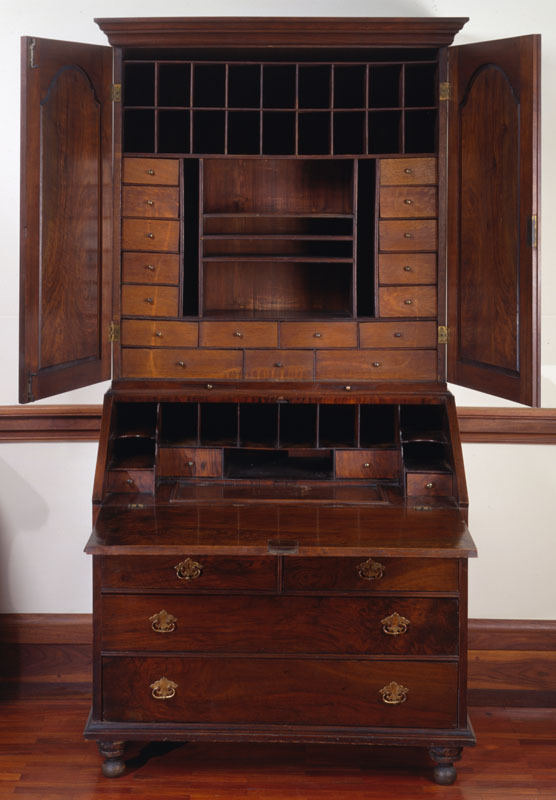 In 1827, the desk was owned by Nathaniel Coleman, a silversmith of Burlington, New Jersey. It was seen by the early historian of Philadelphia, John Fanning Watson, who described it as “in very olde & unsightly condition,” but still in possession of its mirrored cabinet doors, ball feet, and drop-handle pulls, which were sadly later lost. 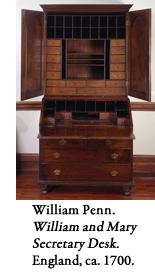 According to Watson, Coleman acquired the desk from the Burlington Quaker humanitarian George Dillwyn, whose family had obtained it from Peter Worrall when the contents of Pennsbury Manor were sold after the Revolution. Pieces of “the true Cross” may be as common in Europe as Mark Twain observed in Innocents Abroad, but objects that can be authentically traced to the possession of William Penn are not. John Jay Smith, formerly Librarian, gave it to the Loganian Library in 1873.